A funny thought occured to me the other day… If the administrative divison into regions goes on as planned and Ljubljana does become a region unto its own, there’s a high possibility that the law will prevent a single person holding both the office of the mayor and that of the regional head. And with regions becoming the pricipal player in defining the financial relations with the government, the position of the mayor will be weakened considerably, as the municipality will (figuratively speaking -or not) be left in charge of painting the road-signs and mowing the lawns. This is still speculation, of course, as the legislation on regions is facing huge obstacles within the rulling coalition, but I do sense a certain anti-Zoki sentiment here… First, they take away the money. Then they choose Maribor over Ljubljana as the country’s Cultural Capital of 2012 (again diverting funds away from Ljubljana). Just a couple of days ago they announced a measure to preserve the current “architectual and otherwise” state of Ljubljana’s Central Market, preventing the start of construction of an underground parking lot there. And now this redistribution of power is looming. A coincidence? I don’t think so… More like a Catch 22. 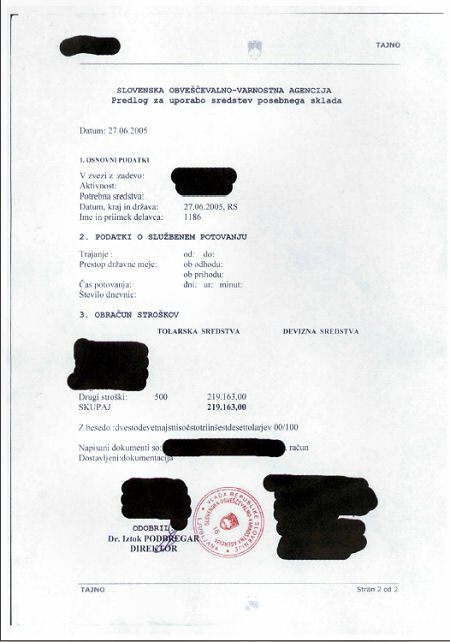 SOVA intelligence agency established and financed a company with its black-ops fund!!!!. A company, yes… Usually, in spy-speak, such a company is called “a front” and is used “to provide a plausible background story, occupation, and means of income” according to this Wiki entry. It is only natural for a spy agency to have a front company (often more than one), is it not? But no, the unsuspecting public is again being fed half-baked information, aimed at tarnishing the reputation of everyone in Janša’s sights, most notably (still) the Prez, with the latest discovery being painted as just slightly better than Judas’ betrayal. BTW: For those of you who can read both Slovene and English: Please compare the Slovene version of PM’s site with the English one. You’ll notice that the latter completely fails to mention the SOVA brouhaha. 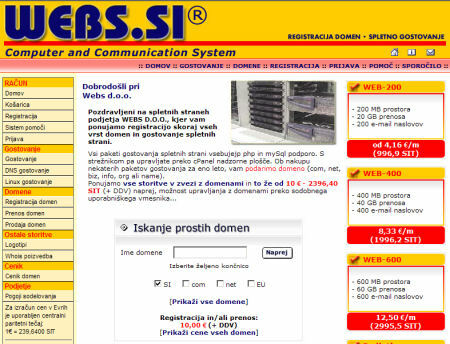 Posted on May 19, 2007 May 19, 2007 Categories Slovenia1 Comment on So What ?!? A sleepy Wednesday afternoon and the fact that I unintentionally avoided going to Portorož percipetated a meeting with Culc for a beer and as I turn to my left, I’m shocked with realisation that our Commander in Chief is quietly smiling and talking to Miha Kozinc, an attorney and his former minister of justice. 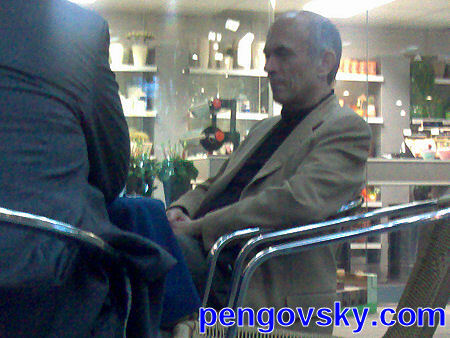 They met at a bar in the passage of Maximarket store, halfway between the presidential offices and the parliament. No bodyguards, no secretaries, nothing. Just Mr. Kozinc and The Prez. I didn’t hear what they were talking about as I was too busy fumbling my N80, trying to covertly take a photo, but I can only imagine that they were talking the all over the latest brouhaha surrounding the document leaks from Slovenian Intelligence and Securiy Agency (SOVA), whicj claimed that the President’s office made the Agency use its black-ops fund to buy and airline ticket to an Indian ayurvedic doctor who examined the ailing Drnovšek. President’s chief of staff immediately filed charges and perhaps the Prez is contemplating the same move. But maybe not… If asked about it, I’m sure he would have said something like “can’t a guy even meet with a friend anymore?” and then put on his secretive smile. I thought it was rather cool of him, sitting in a bar, breaking bread and what have you. As they left he stopped by the next table, patted a dog and chatted with the owner. 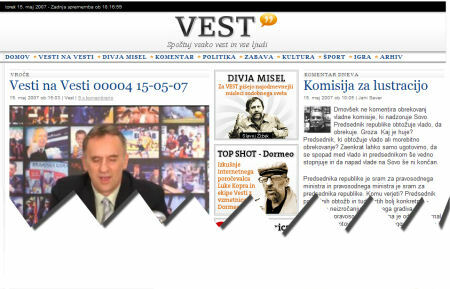 For the uninitiated: Vest.si is a media portal/blog set up by Jani Sever and a couple of his more or less well known associates. Sever was forced out as the editor-in-chief of a left-wing Mladina weekly political magazine last summer after a relentless political pressure. According to my information the right-wing government has instructed state-owned companies to stop advertising with Mladina, which led to a sharp drop in magazine’s income as these companies are the largest adverisers in Slovenia. In any event, Jani Sever was removed and then embarked on setting up an independent web-based media, which turned out to be vest.si. The portal/blog has recently been overhauled and is now featuring a weekly round-up of events, hosted by perhaps the only true media celebrity in Slovenia, Jonas Žnidaršič (also known as the host of Who Wants to be a Millionare). So far, so good and I bow to Sever and his team for keeping the project alive. But I’ve got several problems with this particular concept of weekly round-up, most notable of which is of course the “infotainment” approach. I do not dare to object to the content at vest.si (mostly because it is above average, but also because I’m not forced to check it out anyway, so I do it out of my own free will), but I do take issue with mixing what turns out to be a wannabe-sarcastic video-collage with the rest of the content. Jonas does an excellent job as a presenter. He should. It is just that in my oppinon his trademark sarcasm and cinycism do not mix with the serious nature of the actual news. Vest.si team is great at fishing out embarassing moments of current government, but Jonas’ commentary makes a mockery of what should be serious issues. The paradox that occurs is that it is his appearance in the make-shift studio that makes the round-up watchable, much less the actual content. Of course the main question is, what this round-up actually is. Is it serious, offering the user the benefit of expanded knowledge, is it – in short – news? Or is it a mockery and a parody, a Slovenian version of the Daily Show/Colbert Report with a twist and a knack for using swear words? If the latter is the case, then I think that Editor in Chief shouldn’t publish his editorials in the round-up, because they either lose credibility or give undeserved credibility to the show. It is like pouring vodka and whiskey in one glass. Some things just shouldn’t be done. However, If the round-up is considered news, then I’m sorry to say that it fails the most basic journalistic test: relevance. Namely: what is the point of having a news round-up when all news is published in full anyhow? The video is too long to watch as one can check out a good portion (if not all) of the latest entries on vest.si within those ten minutes and decide for oneself on the relevance of a particular piece of news. Truth be said, there is some progress. In the latest edition Jonas refrained from using swear words. A big plus. But there is still a long way to go. And I don’t think that the content of vest.si would be any less interesting if it hadn’t been for this round-up. I’ve no illusions about this. I’m positive that the round-up with Jonas will be one of the more accessed and viewed features on vest.si. I just think it’s a bad idea. But what on Earth am I saying??? Here I am bitching about it, when I’m reguralrely posting naked chicks and guys and swearing al the time, while trying to project an image of a left-wing intelectual. I guess the only difference is that I do it for kicks, whereas vest.si is said to be a true and independent media. I’d hate to see their reputation tarnished because of a small screw-up. UPDATE: Today’s (Wednesday) edition was much more to my liking – both in terms of what was said in the post and in the comments, as well as pleasing my own taste for content.